A small Auk / Breeding Summer Visitor / An unmistakable bird with its black back and white underparts, and distinctive black head with large pale cheeks and a tall, flattened , brightly-coloured bill / Digs or occupies ready - made burrows , often made by Rabbits or Manx Shearwaters . Resident on Skomer and Skokholm Islands from late March to early August / Spending the other time at sea / Each spring the birds return and quickly commence the task of preparing the nesting burrow for the new season / During late April a single egg is laid which takes about 42 days to hatch / 1 Brood , Incubation 40 days / fledge in 34-44 days. 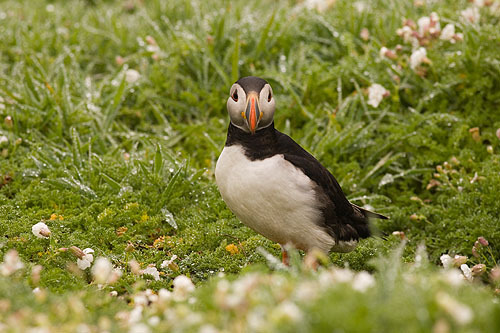 Young Puffins are fed from early June to early August , by adults with beaks full of fish / Young Puffins spend there first few years at sea ( Bay of Biscay ) .